Entering the match on a five-game losing streak, the Quinnipiac women’s volleyball team battled out a 3-1 victory against Manhattan College at its home court on Sunday. The Bobcats (7-15 overall, 6-3 Metro Atlantic Athletic Conference) saw a spark in their offense as young players took full advantage of the struggling Jaspers (1-23 overall, 1-10 MAAC). The Bobcats began the afternoon with a shaky start, just barely squeezing out a 27-25 win in the first set. Lack of communication and numerous service errors had assistant coach Chad Davis wincing from the side lines as Quinnipiac fell to Manhattan 26-28 in the second set. After a quick locker room visit following the second set, the Bobcats exploded to win the final two sets 25-15 and 25-20 respectively. Previously losing five straight, this win was essential to improve Quinnipiac’s mentality. Stepping up to make a huge impact in this game was opposite hitter Morgan Sherwin. Sherwin led the team with 19.5 points and 16 kills, marking a career-high for the freshman. “We knew we had to win to keep this season alive, so to come out, even though it was in four, it was a great win for everyone,” Sherwin said. With the numerous players out due to injury, the success of their young players is something that the coaching staff has been hoping to see. While the performance of Sherwin was a notable highlight of the game, the same can be said for the persistence of the Bobcats’ defense. Sophomore libero Alejandra Rodriguez led the team with 12 digs, helping to eliminate scoring opportunities for the Jaspers. “Our defense was picking everything up, and Maria (Pansari) was doing a great job setting everyone,” Sherwin said, smiling as she looked around to her teammates. Due to the incredible passes by the Bobcat defense, Pansari was able to wrack up 49 assists on the afternoon. Alongside Sherwin was sophomore Kaleigh Oates, who was also able to find holes in the Jasper defense 16 times as well. Oates led the team in hitting percentage, commanding a 0.615 in this matchup. 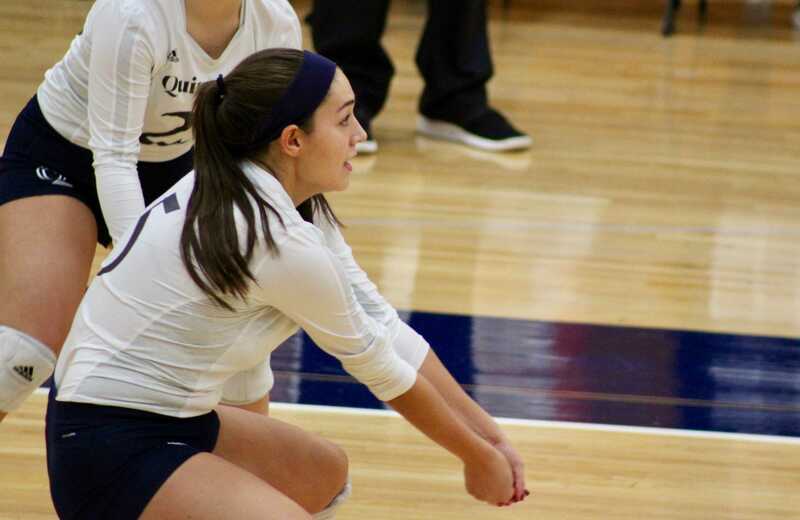 In addition, her consistent positive attitude both on the court and on the side lines is quickly developing her into a valuable player for Quinnipiac. The Bobcats are currently in seventh place in the MAAC, missing a playoff spot by just seed. In order to improve their chances of clinching, Quinnipiac needs to continue to minimize errors and capitalize offensively. Quinnipiac looks to continue their success at home as they take on conference leader Fairfield University (16-6 overall, 11-0 MAAC) on Friday, Oct. 27 at 7 p.m.